Can someone let me know if these are real and if they are 10mg? thats what i was told. just want to confirm. Thanks! arnt those the 5mg anabols? They sure look like the 5mg tabs, unless the new Thai are 10mg and look the exact same. But from other pics I've seen, it looks like the 5mg pills. The consensus is in!... they are definately Pink thailandian d-bol from the British dispensory 5mg...they are my favorite ...the breakfast of champion's! I have seen pics of fakes of that stuff. Might wanna show a better up close view, or do a search, as I am sure someone posted a thread on the fake version w/pics before. They look like Thai d-bol (or more precisely, Anabol mfg. by British Dispensary in Thailand). BD only makes 5mg d-bols, sorry. 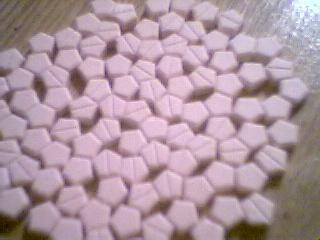 Yep they look the same as my lil' pink 5mg babies, gotta love 'em. They are 5 mg thi d-ball bro ! Hey dude they are 5mg Tai D-Bols just got 300tabs today taking 40mg a day with alot of other gear ! I took them and thoe are thais and 5mg, they work well.